Nothing strikes fear in my expat heart more than the letter I received yesterday. It was from the school, and for tomorrow's School Picnic I have been asked to 'bring an ethnic dish of your choice from your native country'. Bugger. Even if Australia had a national dish of any kind (pavlova? sausage rolls?) 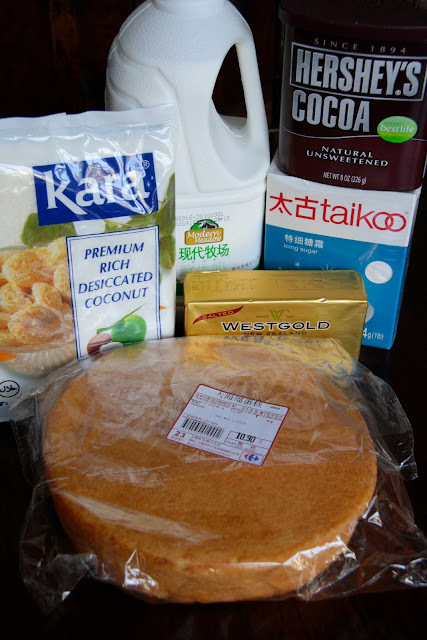 it surely isn't going to be easy to reproduce in Shanghai, 10,000 miles from the nearest Woolies supermarket, my Kitchenaid mixer, and an oven that actually works (see Furnace Brownies for my last baking disaster). Those buggers. This is less like the school picnic and more like a challenge from Survivor. I salute the mother who brought along a box of KFC drumsticks last year. Her native country? America. Call it a stroke of genius, but today out of the blue I realised I could cobble together a plate of lamingtons without too much stress. 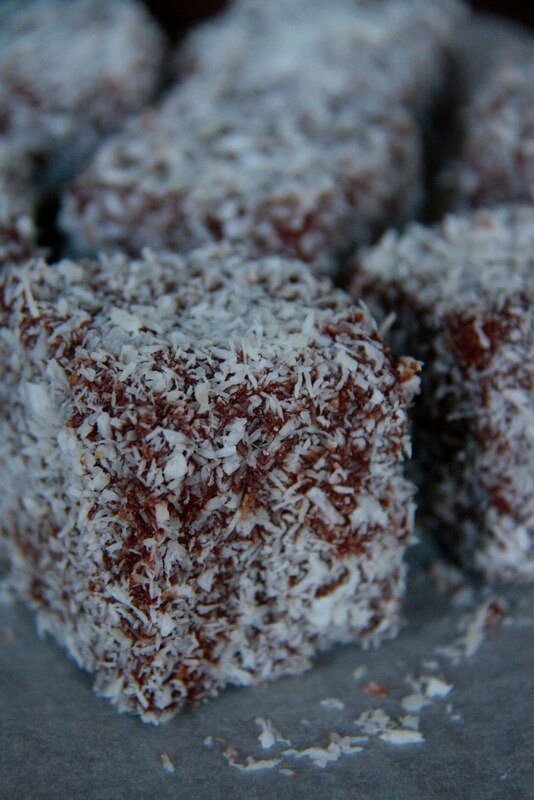 Hands up who knows what a lamington is?? OK, hands down, none of you have any idea. 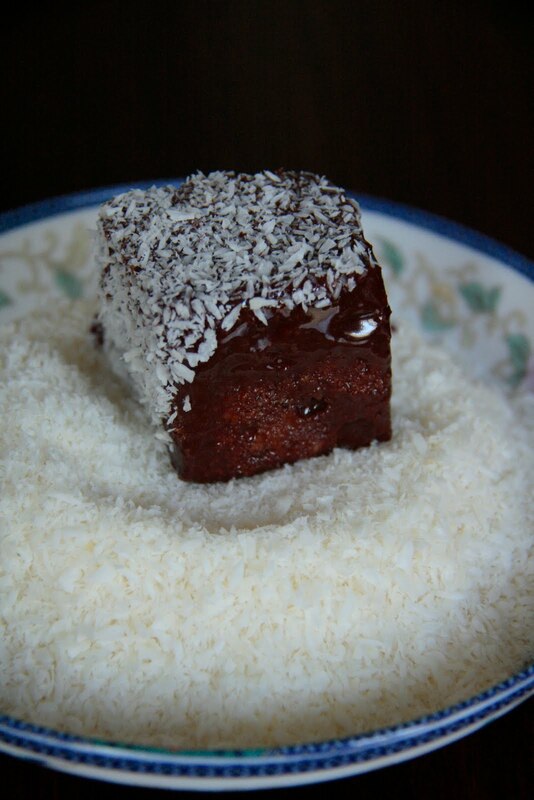 A lamington is Australia's national cake, a delicious concoction of day-old sponge dipped in chocolate sauce then rolled in coconut. Apparently named after the Governor of Queensland c1901, Lord Lamington, after his cook was called on to rustle up something in a hurry for afternoon tea. All that was on hand was a bit of sponge cake left over from the day before, and a pot of melted chocolate. The coconut was to stop it from being too sticky to handle. A recipe follows, and I call these traitor lamingtons because not a single ingredient comes from Australia, and also because I am a traitor to the baking cause for not cooking the sponge from scratch. If you are virtuous enough to make your own sponge, leave it a day to get nice and stale so it doesn't break up when handled. Of course you can make them with any old ingredients you want, but it is quite fascinating from a food-miles perspective to see where all of my ingredients have come from. 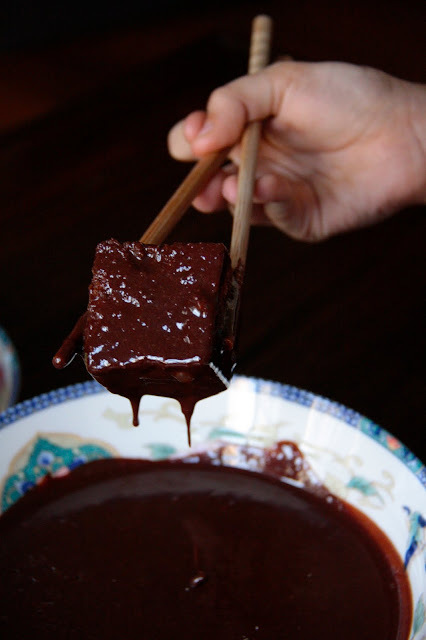 First make the chocolate sauce: mix together the icing sugar, cocoa, butter and milk over a very low heat until smooth, with no lumps. The consistency should be cream-like - quite runny. Add a little more milk if needed to get to the desired consistency. 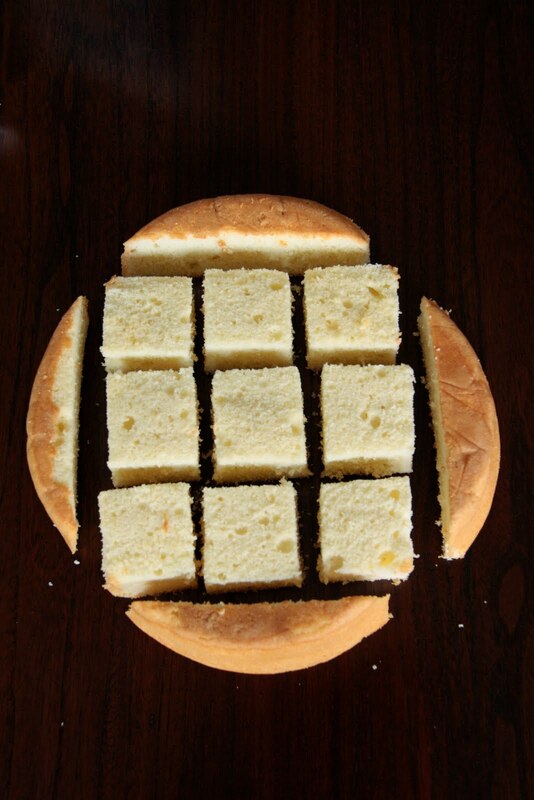 Prepare the sponge cubes by slicing up your cake as shown. Any size up to 5cm cubes is OK, these are 3cm cubes because that was the size of the sponge. Carefully slice off the crust because the crust won't absorb the chocolate sauce. 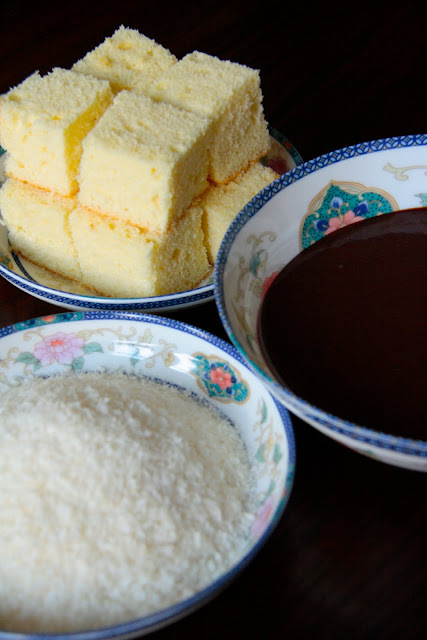 Prepare your work station with everything ready to go - sponge cubes, dish of chocolate sauce, and dish of coconut, and a plate for the finished lamingtons. 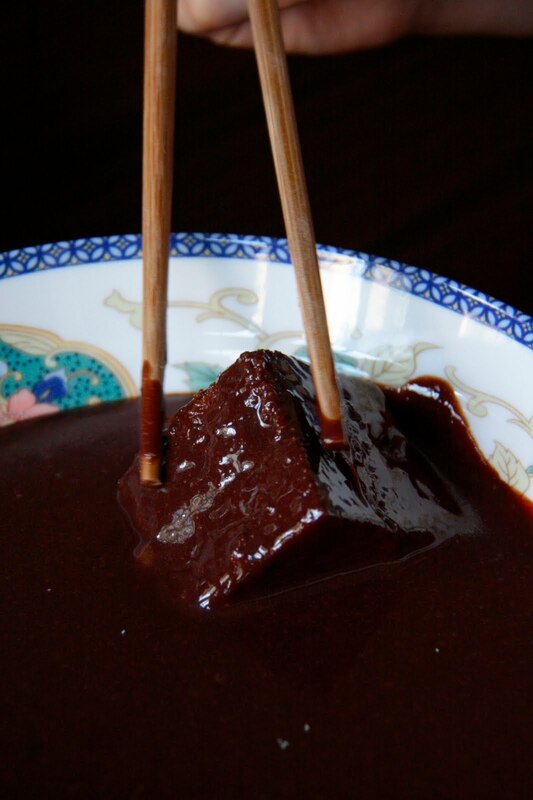 Never thought I'd see the day where making lamingtons involved a pair of chopsticks, but they're perfect for dipping the fragile sponge into the chocolate sauce without damaging it. The sponge should be thoroughly coated, then allow the excess sauce to drip off. Now dunk the sponge cube in the coconut until every side is covered. Refrigerate for half an hour to help the sauce set.